But look how impracticable and dangerous this is, As a motorist I know how invisible cyclists are, so where is the hi visibility or reflective clothing or even bright colours to be seen. No protective helmet strap. (so it can’t fit right!) I would no more dream of riding my bike without a proper fitting helmet, than get into a car without seatbelt. Flowing fabrics to catch in the chain, and what if it rains? ..and those high heels!!!! Do these women never sweaty, or get helmet hair? 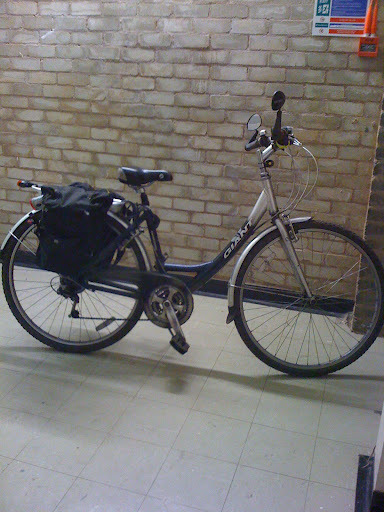 I have cycled when my first son was a baby and then in my thirties, but I bought this one 5 years ago, when petrol prices went uip to £1 13p per litre…… ha! Petrol now costs £1 30p per litre. how much money have I saved.. I use my bike for transport. But I hate looking like a cyclist that is a frustrated tour de France rider! Apart from anything else, I am female, old and not slim, so Lycra does not do anything for me!. But there are practical considerations, So I have a collection of red coats! and I am obsessed with cycle bags that do not look like cycle bags! 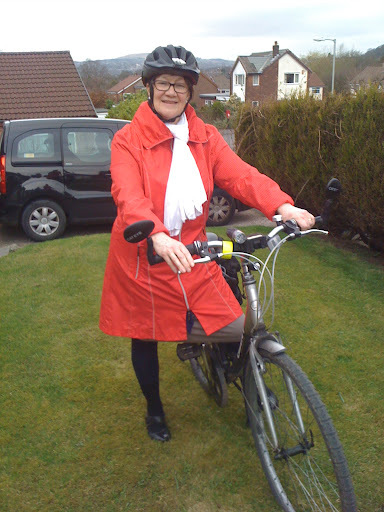 When I cycle to town or to the shops I do not want to walk around looking like a cycle geek! 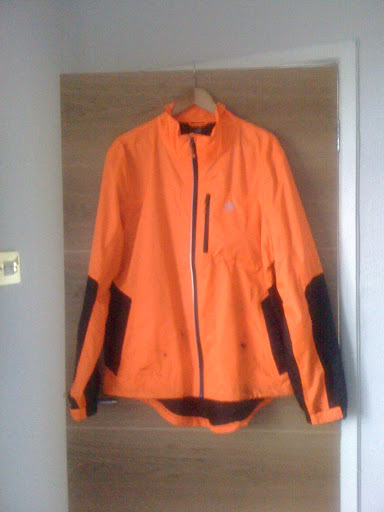 I cycle to work at 0615h in the cold and dark, up steep hills and often in the rain. I once read a question, “how do you keep dry on a bike? answer, you don’t. LOL! this is because if you wear a jacket that prevents rain from soaking through, the condensation formed inside makes you wet. So I am just resigned to being damp in the rain!..and it rains a lot around here. So then I need clothes that will be seen and which will dry out at work before the ride home.. And of course I need to shower before work and have a change of clothes. This is my jacket for work. Hi visiblity, reflective panels, waterproof and breathable. Roomy enough to wear a sweater underneath for those freezing cold mornings. I have lots of lights. Flashing in my helmet, flashing on the bike. Two at the front and three at the back. I wear hi visiblity reflective clothing and a well fitting helmet. But I would love a bit of cycle chic as shown on the images on this website. and look at this pannier! beautiful. I want it! There ARE chic helmets around, like this Yakkay one, which I LOVE, but a but pricey at 94 euro! Cyclechic advertise this black mac with reflective panels. at £129…… don’t they know cyclists want to save money! But frankly, only a fool, or somebody with a death wish wears black on a bike during the day. (and where is the helmet?) Motorists may be more cycle aware in London or big cities, but here, because there are not a lot of us around here, they just do not SEE you unless you are lit up like a Christmas tree. So unfortunately this is the best I can do! Well I think you look very chic Denise, as well as being highly visible! Bright colours are very now! I love your "look", Denise – sensible and stylish! And bravo for having the determination to cycle to work at 6:15 in the morning. That's an impressive feat! Good choices, Denise! I admire that you bike to work! Bravo!